NASA's Aqua satellite observed fragmented feeder bands of strong thunderstorms spiraling into the low-level center of Tropical Cyclone Doksuri. 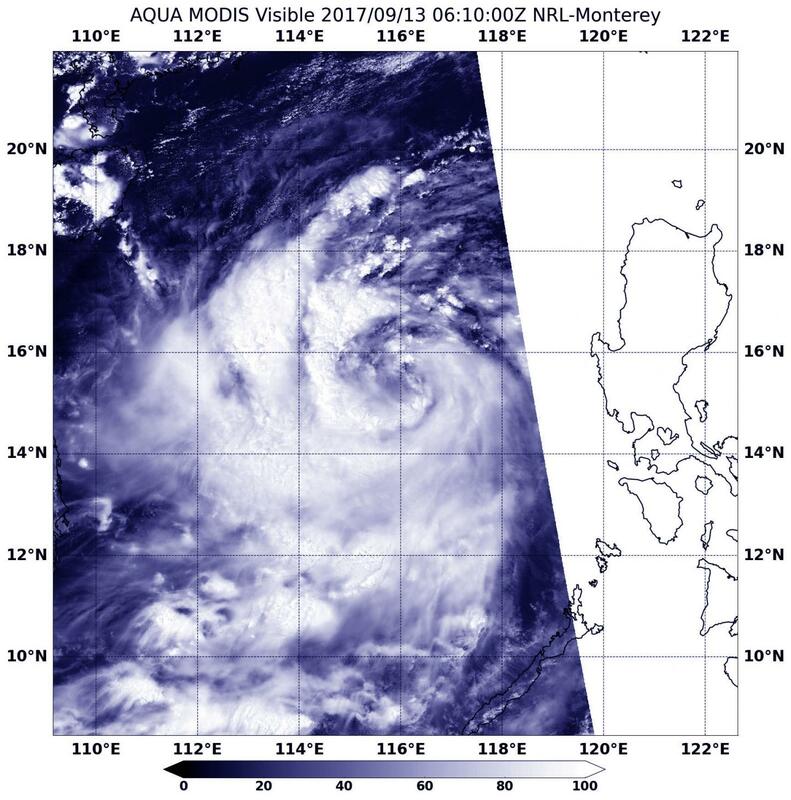 On Sept. 13 at 2:10 a.m. EDT (0610 UTC) the Moderate Resolution Imaging Spectroradiometer or MODIS instrument that flies aboard NASA's Aqua satellite captured a visible-light image of the storm as it moved west in the South China Sea. Fragmented bands of thunderstorms spiraled into the center from the western and southern sides of the storm. Tropical depression 21W strengthened into a tropical storm and was renamed "Doksuri." On Sept. 13, 2017 at 11 a.m. EDT (1500 UTC) Doksuri's maximum sustained winds were near 51.7 mph (45 knots/83.3 kph), so it is at tropical storm strength. Doksuri was centered near 15.8 degrees north latitude and 114.0 degrees east longitude, about 359 nautical miles east of Da Nang, Vietnam. Doksuri has tracked to the west-northwestward at 16 mph (14 knots/26 kph). The Joint Typhoon Warning Center expects Doksuri to intensify over the next day and a half and move through the Gulf of Tonkin and make landfall in northeastern Vietnam on Sept. 15. After landfall, the system is forecast to rapidly erode and dissipate by tau 72 over the mountains of northern Thailand.